Trail mix might sound like the ultimate health food, but most brands available at your local market are so chock-full of added sugars, they’re more on par with eating a candy bar. So what’s the secret to enjoying trail mix as a portable, healthy, snack while you’re on the go? Make it yourself! By creating your own custom trail mix creations at home, you have complete control over the ingredients. 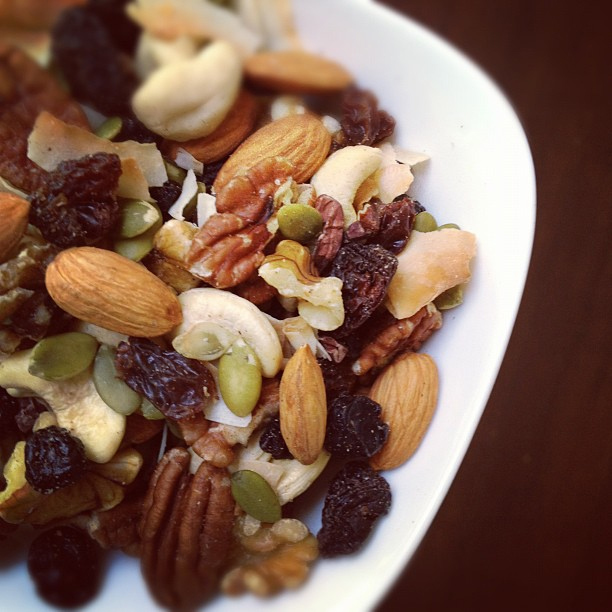 Paleo, primal, vegan, or raw – there is a perfect trail mix recipe just for you. Looking for inspiration? 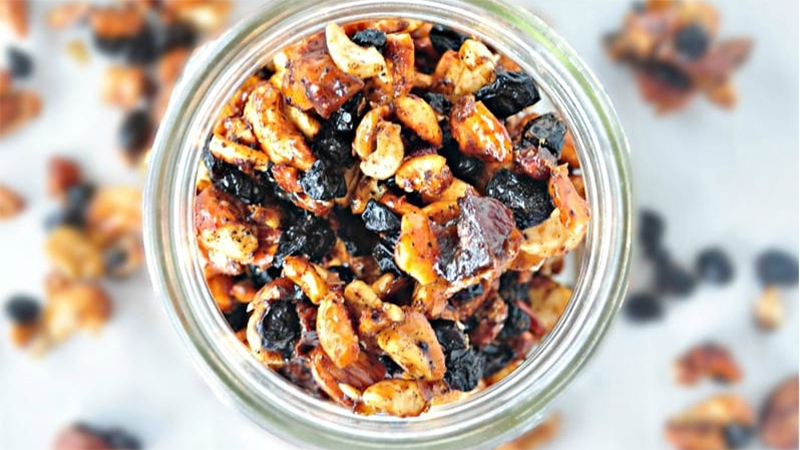 Here are 10 healthy homemade trail mix recipes to get you started. Yes, you cavemen and cavewomen can definitely eat trail mix. 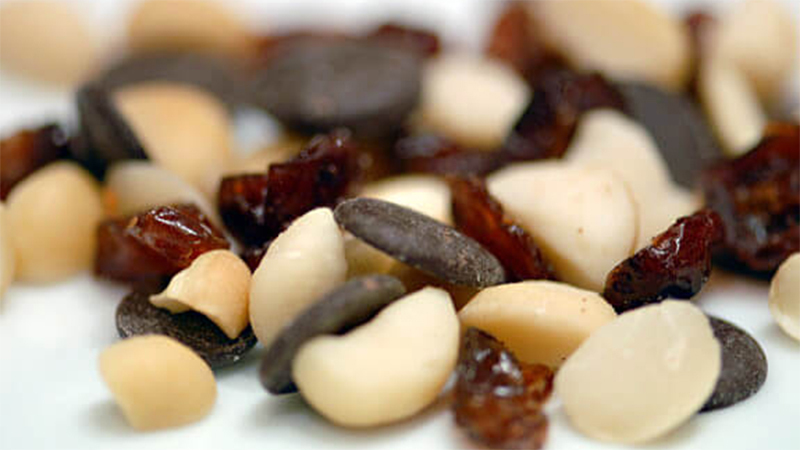 These Paleo-friendly trail mix recipes contain plenty of raw nuts, seeds, and dried fruits to give you the energy you need to live the primal life. 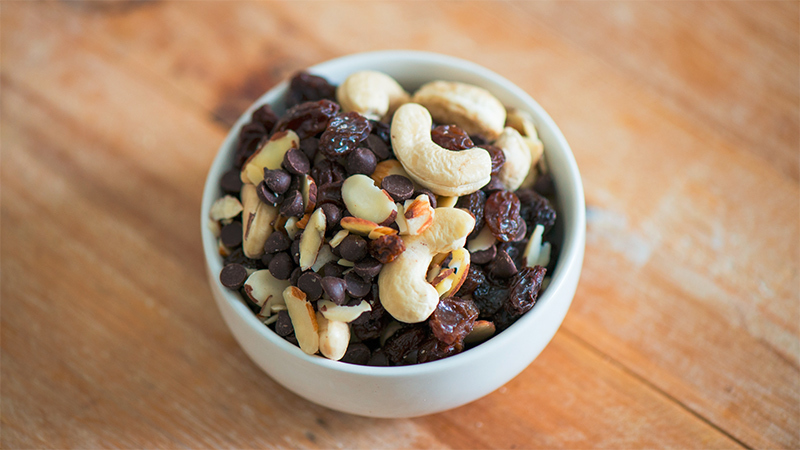 Untraditional Trail Mix from Paleo on a Budget features just four ingredients: raw cashews, sliced raw almonds, raisins, and dairy-free chocolate chips. Cashews and almonds are great sources of magnesium, an essential mineral that can help relax your muscles and your mind. 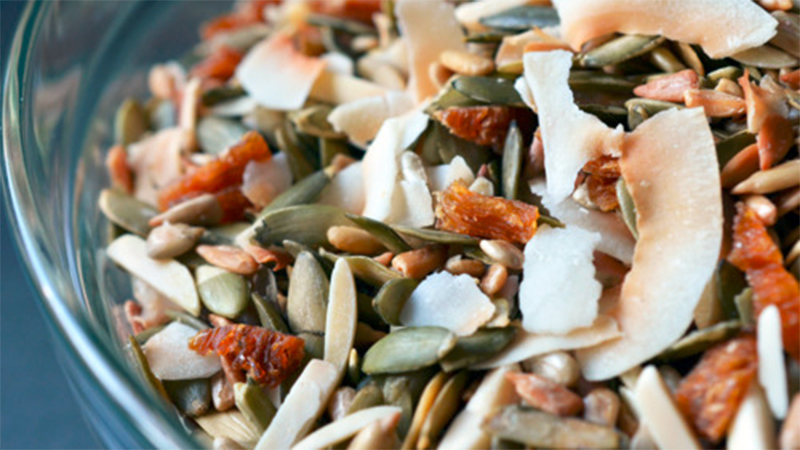 This Paleo Trail Mix by Nom Nom Paleo has a tropical flavor from dried pineapple and coconut. Almonds, sunflower seeds, and pumpkin seeds provide plenty of healthy fats, antioxidant vitamin E, and zinc. Zinc is an essential mineral that is of particular importance to male sexual health – it regulates testosterone production, and supports fertility and prostate health. We will call this Paleo Trail Mix by Guilty Kitchen the “guilt-free” mix because of its inclusion of so many health promoting superfoods, including raw organic nuts (cashews, almonds, walnuts, and pecans) are combined with pumkin seeds, raw cacao (cocoa), and dried blueberries and cherries. Blueberries and raw cacao have one thing in common: they are both incredibly high in beneficial antioxidants that can fight free radical damage that leads to aging and illness. Raw cacao is also a great source of vitamins and minerals, so you don’t have to feel guilty at all about the “chocolate” in this trail mix. The best thing about the Sweet and Salty Primal Trail Mix by Marks Daily Apple is the warm and comforting flavours of vanilla, nutmeg, and cinnamon. Of course, the raw nuts, seeds, and apricots sweetened with a touch of raw honey are swell as well! Be sure to use sea salt and not refined table salt – sea salt is a natural source of essential minerals. Vegan trail mix recipes will be free of all animal products, and some may include raw ingredients as well. Raw foods are never heated above 115 degrees in order to maintain the living enzymes that support digestive and overall health and wellbeing. These “living” plant foods will energize your body while exciting your tastebuds. A vegan trail mix recipe that sounds more like a dessert, Blueberry Vanilla Cashew Trail Mix by My Whole Food Life is sure to have you coming back for seconds. Blueberries, almonds, and cashews are sweetened with real maple syrup (or raw honey) and dates. Coconut oil and vanilla will trick your tastebuds into thinking you are splurging on a treat. Choose organic, wild blueberries whenever possible, they have twice the antioxidant power over conventional cultivated berries. 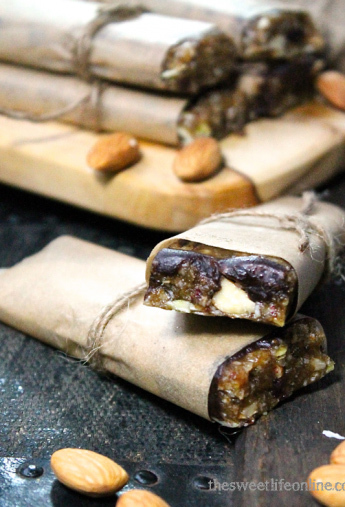 You can make trail mix into an even more convenient, on-the-go snack when you make the Raw Trail Mix Bars by My Darling Vegan. Raw walnuts, coconut, dates, chia seeds, almonds, cacao nibs, pumpkin seeds, sunflower seeds and raisins form the bars, and a raw chocolate drizzle adds a decadent touch on top. Chia seeds are a high protein, high fiber food and an excellent source of Omega-3 fatty acids. 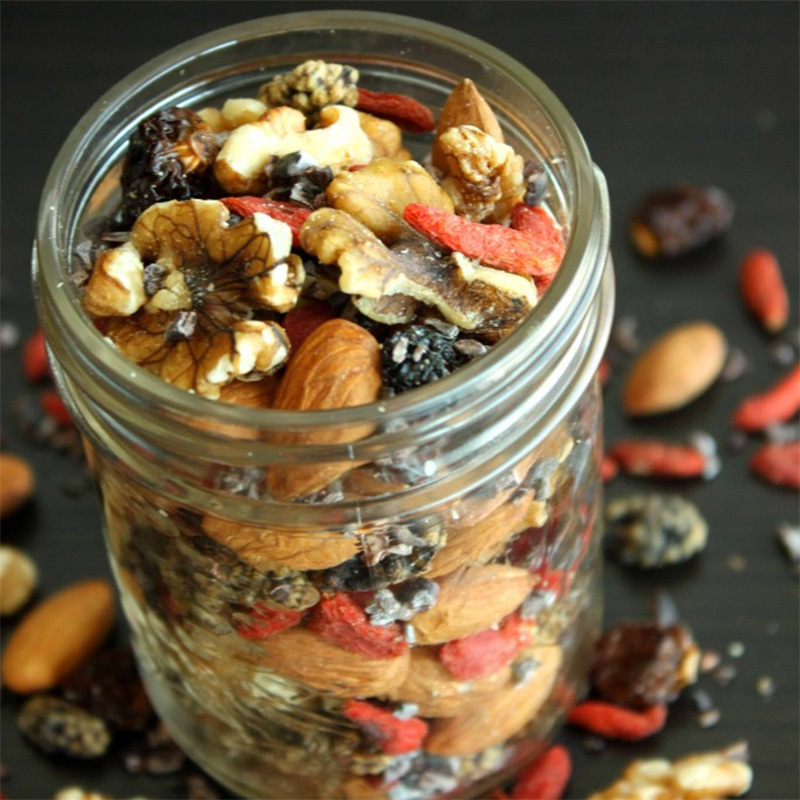 If you have ever wanted to try Superfoods like goji berries, this trail mix with superfoods recipe is the perfect introduction. Goji berries have been used as a Traditional Chinese medicine for thousands of years, and are one of the most nutrient-dense foods on the planet. 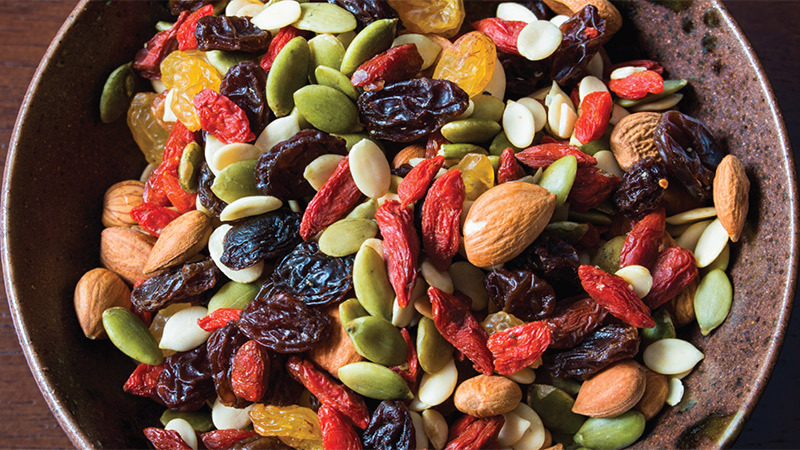 Golden raisins, sour red cherries, whole almonds, sunflower seeds and shelled pumpkin seeds add even more nutritional punch to this raw trail mix recipe. Another Superfood Trail Mix recipe, this time by Jesse Lane Wellness, uses goji berries to provide a nutritional and tasty punch. Mulberries, golden berries, raw cacao, almonds and walnuts join the tart and tangy goji berries in this simple trail mix. Don’t let the short ingredient list and easy instructions fool you – this mix will provide a hefty dose of vitamins, minerals, antioxidants, healthy fats, fibre and protein to your day. Trail mix can be adjusted to fit any diet or lifestyle by adding the ingredients you love to eat and omitting the ones that you need to avoid. 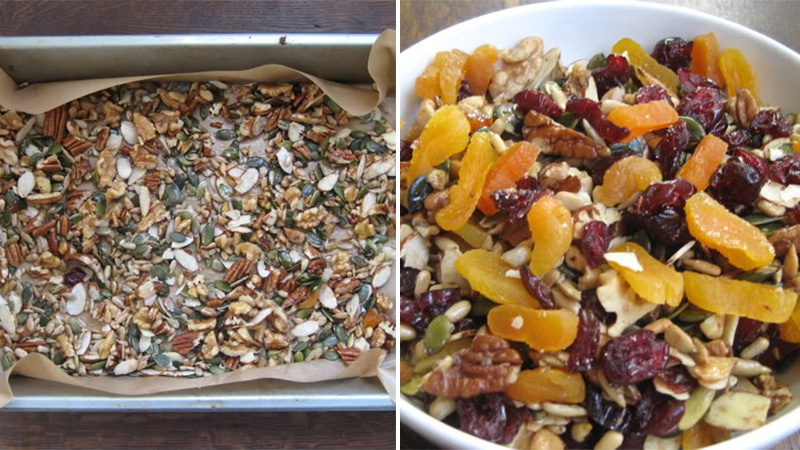 Since most trail mixes are built on a base of nuts and seeds, the calories can add up quickly. One clever way around this is to add a low-calorie ingredient, like popcorn, to bulk up your trail mix while lowering the calories. Popcorn may not sound like a traditional ingredient, but the Easy Popcorn Trail Mix by Nutritious Eats shows us that it can be a great way to cut the calories, if that’s your end-game. Dried strawberries are another twist, adding a touch of sweetness and plenty of vitamin C to support immune and skin health. While it still has walnuts and sunflower seeds, the popcorn will make for a lighter-than-air version that won’t hinder your weight loss efforts. Simple, gluten-free, and easy to make, the Favorite Trail Mix by Elana’s Pantry can be made by even the most novice cook in the kitchen. 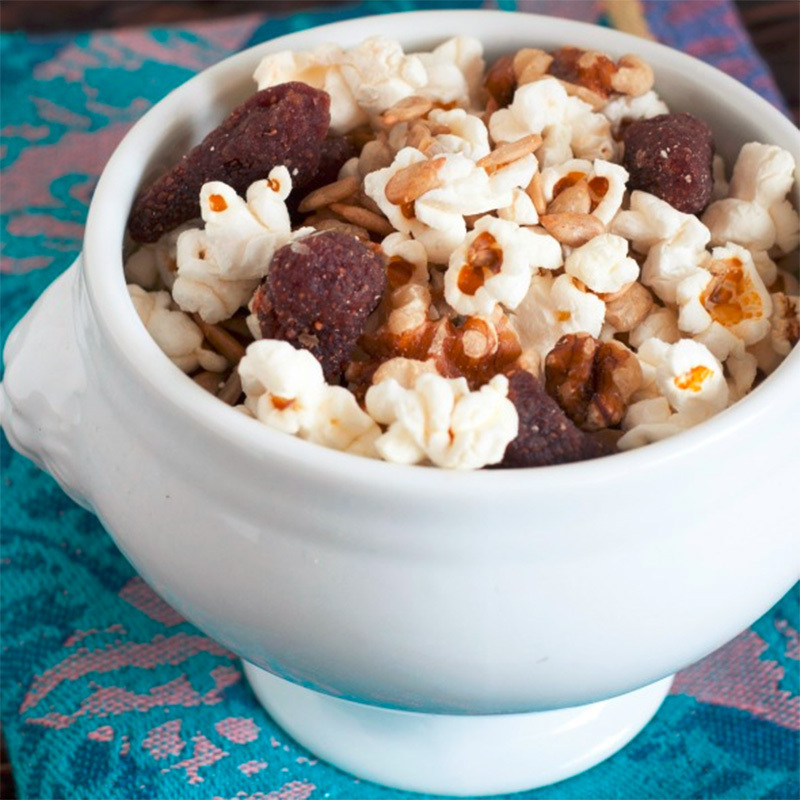 Macadamia nuts, dried cranberries, and chocolate chunks are the only three ingredients in this snack. Cranberries are a powerful fruit that contain plant compounds shown to protect against bacterial infections and heart disease. Just because this recipe has only three ingredients doesn’t mean it is not a healthy snack! Your favorite Paleo, raw, vegan, or superfood trail mix recipes can help support your healthy lifestyle and diet, but be sure to watch out for portion sizes. All of those nuts, seeds, and dried fruits are not completely calorie free! As an alternative to store bought mixes and bars, however, you couldn’t find a healthier snack than a home-made batch of trail mix.